Life Quotes and Sayings: There are two ways of being rich. One is to have all you want, the other is to be satisfied with what you have. There are two ways of being rich. 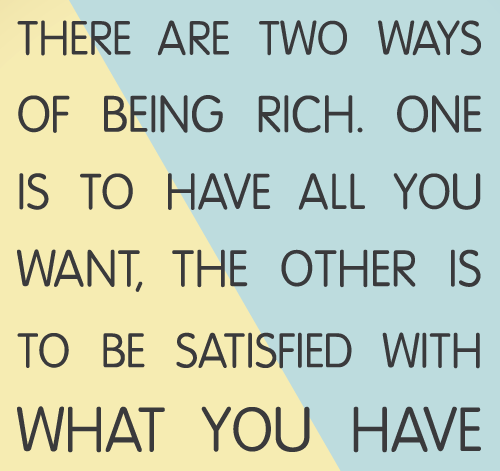 One is to have all you want, the other is to be satisfied with what you have. How easy is it for you to really feel satisfied? Look around you right now and notice your surroundings. Do you like what you see or do you see what you don't like? How do you feel about yourself right now? Can you truly appreciate yourself today, still knowing there may be aspects you would like to improve? The higher you live on the Levels of Awareness, the more likely you are to feel satisfied. That's true because the more aware and capable of making good choices you are, the less you are caught in struggle. The higher on the Levels of Awareness you live, the richer you are likely to feel, not only in terms of finances, but also in terms of personal satisfaction. Being satisfied is an inside job. No amount of money or material good can give you the inner feeling of satisfaction. We are not taught to be satisfied. We are taught and trained by the media to want more. Today don't chase satisfaction. Sit still for a moment and let it bubble up from inside you, like an underground stream.